The Oriental Shorthair, a Siamese hybrid, is available in a broad array of colours and patterns. The Oriental Shorthair is a relatively recent breed. 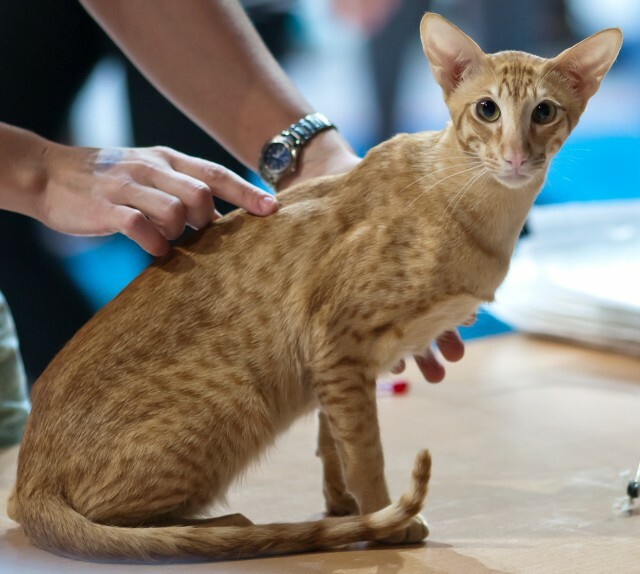 In the 1950s in the UK and the 1960s in North America, breeders began cross-breeding Siamese cats with Abyssinians, American Shorthairs, Burmese, and Russian Blues to develop the Oriental Shorthair breed. 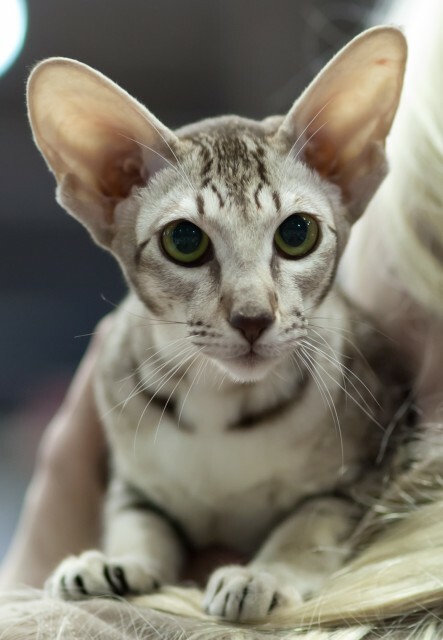 Although it was only accepted for championship status by the Cat Fanciers’ Association in 1977, the Oriental Shorthair quickly became one of the top 10 most popular cat breeds. Solid – Colour from root to tip of each hair is the same. Shaded – Cat has a white undercoat, coloured shading (tips of the fur) down the sides, face, and tail; and white chin, chest, and underside. Smoke – White undercoat with tips of a deep colour; the cat in repose appears to have a solid coat; the “smoke” is only apparent when the cat is in motion or the fur is parted. Parti-Colour – The coat is solid with patches of red or cream – may include soft intermingling of several different shades. Bi-Colour – This is a two-colour pattern with white muzzle, chest, underside, legs, and feet, and an inverted V-shaped blaze on the face. Tabby –Tabby stripes or spots and a letter “M” marking on the forehead; Tabby Orientals may be Classic, Mackerel, Spotted, or Ticked. As with the Siamese, there are two primary Oriental body types – Modern and Traditional. The Modern (Extreme) Oriental has an elongated triangular face, slanted blue or green almond-shaped eyes, very large ears, and a long-legged slender body, whereas the Traditional (Applehead) Oriental has a slightly stockier body, a rounder head, rounder eyes, and smaller ears. There is also the Classic type, which is somewhere in the middle. Despite its tendency to be lean and its elegant, dainty appearance, the Oriental is a sleek, muscular, athletic cat. When picked up, Orientals are heavier than they look. There is a long-haired version of the Oriental, known alternately as the Oriental Longhair and the Javanese. This breed was created in the 1970s by breeding Balinese cats with Oriental Shorthairs. Javanese cats have plumed tails and medium-long silky fur that lies flat along their bodies rather than fluffing out like that of a Persian. They shed less and have less intensive grooming requirements than other long-haired breeds. Photos of Oriental Longhairs can be found on the Cat Colours blog. The Oriental cat’s temperament is virtually identical to that of the Siamese. Traits common to both include high intelligence, an affectionate nature, and the tendency to be vocal. These chatty cats will often greet their owners at the door and tell them about their days. They also have a tendency to follow people around, and many show intense loyalty toward one person, sometimes even refusing to bond closely with other people in the household. Playful and spirited Orientals are graceful athletes that enjoy leaping from high places and running around the house. Mischievous and entertaining, Orientals are a good choice for those who want an active, clever cat. Orientals are interactive pets and should not be left alone for long periods of time. If adopting kittens, bringing home two or more littermates to keep one another company is recommended. There are three genetic vulnerabilities associated with the Oriental: gingivitis, amyloidosis (a liver disease), and cardiomyopathy (a heart disease). Preventative dental care and obtaining kittens from a reputable breeder will significantly reduce the risk of problems. Typical prices for pet quality Oriental Shorthair kittens range from $250-$600. Pet quality Javanese (Oriental Longhair) kittens go for $200-$300. Show quality kittens cost more, with prices varying based on type, bloodline, and other factors. Adult Orientals can be adopted through various rescue organizations. Visit the Oriental Shorthair and Javanese Breed Rescue listings for contact information. Agresta, Bob, & Kultala, Joann. (14 June 2009). “Breed Profile: Oriental.” CFAinc.org. Choron, Sandra; Choron, Harry; & Moore, Arden. (2007). Planet Cat: A CAT-alog. New York, NY: Houghton Mifflin Company. Helgren, Anne J. (2009). “Choosing an Oriental.” PetPlace.com. Keyer, Julie, CFA Oriental Breed Council. (31 August 2009). “Colors.” OrientalBC.org. So thankful for this website! I was going bananas trying to figure out what kind of breed my cat belonged to. I can finally say she is an oriental short hair. chinchilla coat by the way. Thank you! 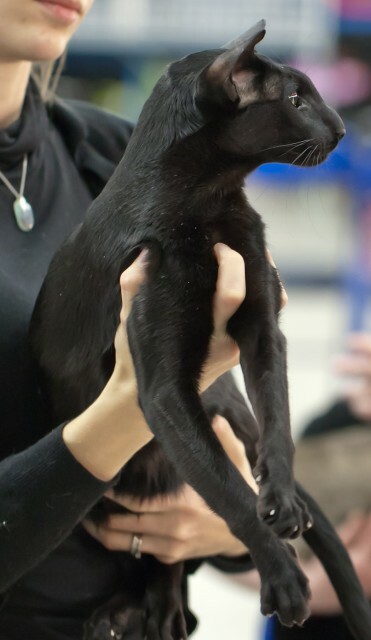 Hi, does anyone know any breeders of the black oriental shorthair cats? A retired cat would also be welcome? I reside in Florida, and they are rare to find here. Thank you.